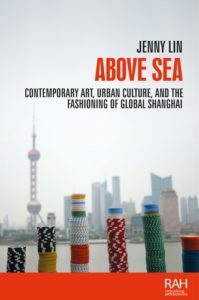 Above sea: Contemporary art, urban culture, and the fashioning of global Shanghai intervenes into global contemporary art discourse, exploring the local cultural histories, sociopolitical contradictions, and buried layers behind Shanghai’s glamorizing art and design. Homay King’s Lost in Translation: Orientalism, Cinema, and the Enigmatic Signifier, which examines depictions of Asian identity in art and Hollywood films. King deploys the enigmatic signifier to brilliantly argue that stereotypes arise as projections of individual fears and unknowing. I make all my students read this! So many! Unexpected and fabulous places I visited include the China Club in Hong Kong, stylized to resemble Republican Era Shanghai and full of contemporary Chinese artworks from Sir David Tang’s collection; the peaceful home of artist Pang Xunqin’s daughter Pang Tao; a noisy café in Beijing, where I interviewed Xu Bing; the private archives of Red Guard collector Liu Debao; and the studios of many incredible artists in Moganshan and other art districts in Shanghai’s outskirts. I mostly type on a laptop, but prefer a notebook and pen in the field. I’m so inspired by the work of Amelia Jones and Marsha Meskimmon, who edit MUP’s Rethinking Art’s Histories series. The support of these two illustrious scholars has been invaluable. I’m thrilled to be in this series, which challenges the field of art history with non-western, feminist, and queer perspectives. I’m writing a new book, tentatively titled, New Silk Roads: The Global Art/Fashion System, that critically examines Euro-Asian art/fashion exchanges, especially between Chinese and Italian artists and designers. Remember the story of old man Sai who lost his horse (塞翁失马/Sai weng shi ma), a fable illustrating how perceived loss can bring good fortune, as when Sai’s horse runs away only to return with a beautiful mare. When researching, transform apparent dead ends and runaway horses into unexplored paths and new modes of transport. I enjoy reading non-fiction about globalization and organized crime, exemplified by Roberto Saviano’s fascinating and terrifying book, Gomorrah, which deeply inspires my current research. May I invite ghosts? If so, I would invite Walter Benjamin, Pang Xunqin, and Zhang Ailing to hot pot followed by a game of Mahjong. Above sea: Contemporary art, urban culture, and the fashioning of global Shanghai is available to buy now. Jenny Lin is Assistant Professor of Contemporary Art with Asian Focus at the University of Oregon. Category: Art History, Author Q&A, Blog, Fashion	0 Comments.